Early 1900s - Originally, packers established field price schedules using a base size of 80 prunes per pound. For every size count lower than 80, one dollar per ton (or point) was added to the base price. For every size count higher than 80 prunes per pound, a dollar was subtracted from the base price. Average grower prices were often below $100 per ton during this period. Following WWII - Prune prices increased to several hundred dollars per ton and the dollar-per-point increment was no longer adequate to reflect market value of larger prunes vs. smaller prunes. To provide suitable price levels, the price schedule was broken up into 10 point increments, but the dollar-per-point, or 'basis points', were still calculated from the 80 count base and added to the price. For example, the price in 1974 for prunes in the 61 to 70 count range was $460 per ton. If a grower had an average count of 65, he would receive $475 per ton (base of $460 + $15 basis points). 1974 - A 'modified grader' was introduced as a way to separate prunes into 4 size categories (A, B, C and D) so that packers would have an indication of the size mix of each delivery. 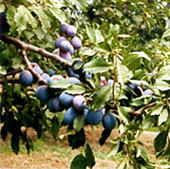 1991 - In order to deal with larger crops and excess supply of smaller prunes, the system of pricing was modified. That year the PBA and prune packers negotiated a field price based on the average size of the 3 largest categories of the modified grader. The base size was changed to 75 count and the 10 point categories were eliminated by increasing the basis points from $1 per ton to $10.50 per ton for larger prunes and $14 per point per ton for prunes smaller than 75 count. The base price that year was $780 per ton. 1996 - A further step was taken to deal with oversupply. That year size count pricing was dropped and a single price was negotiated for each size category of the modified grader. This step simplified the price structure and sent a clear message that growers would be better off screening small prunes in the field since several heavy crops in a row had created an abundance of small prunes and lowered their value. 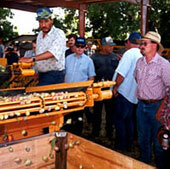 Growers accepted this change readily and many added harvest screens to the back of harvesters. This helped lower their drying cost and eliminated the least valuable fruit from deliveries, increasing efficiency and reducing total tonnage. 1998 - The industry adopted a 24 screen undersize regulation, thus increasing the undersize screen from 23/32" to 24/32". At the same time the screen sizes of the C and D categories were changed from 26 to 28/32" and from 24 to 26/32" respectively. Prices on each screen were adjusted accordingly.